Warning: this is not a glamorous post. I’m literally about to talk to you about broth. Not even soup! Broth. Good ol’ broth. 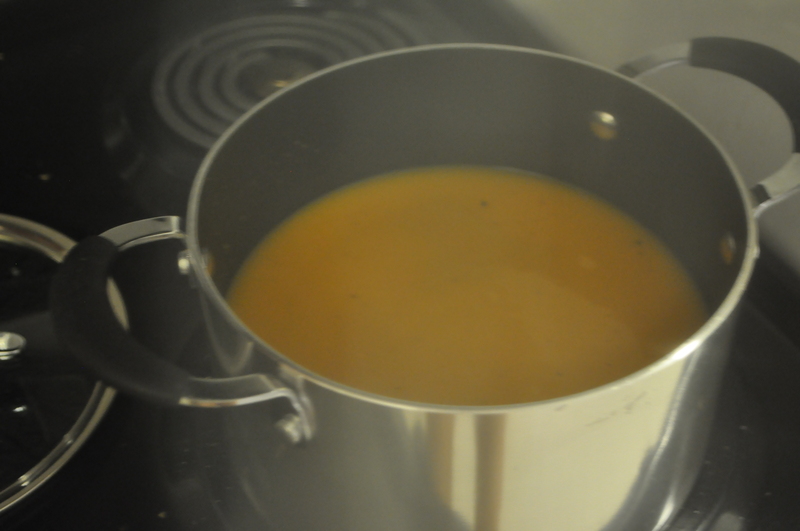 Chicken stock is among my favorite things in the universe–that is, when it is made well. It makes my tummy happy, it feels like an elixir of life when you’re sick, it makes your whole house (nay, apartment) smell awesome…essentially it’s just the best. I have my mama to thank for my broth-making tendencies. 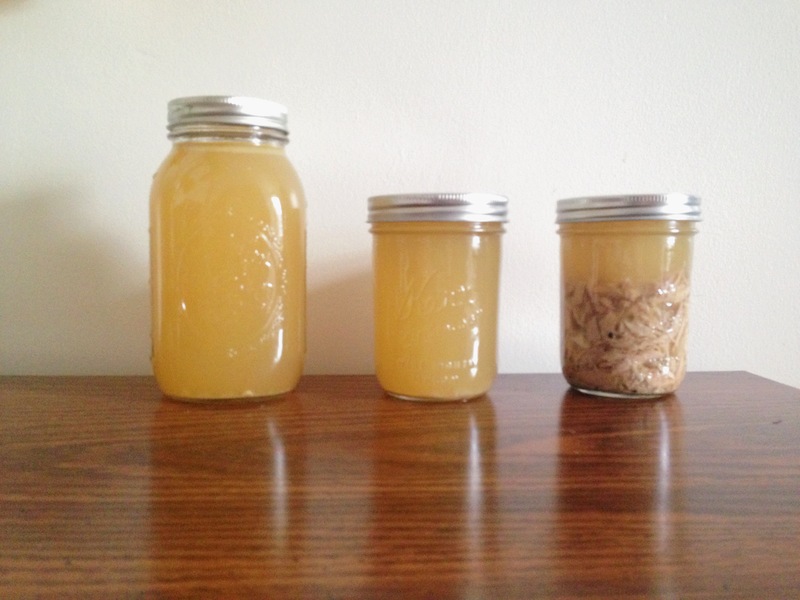 Now, making your own chicken stock is not for the faint of heart. For some reason or another, my past two roommates have been vegetarians and I always feel extremely guilty when they are/were present for my meaty excursions. Chicken broth is probably among the worst undertakings for a veg girl/guy to watch. I literally dig my hands into a bowl of steaming chicken bones and pick all the goodness off with my fingers. You can’t even really be a squeamish meat-eater to do this, ladies and gentlemen. But believe me, it is beyond worth it if you can stomach the process. Put your ingredients all together in your stock pot and fill with water until the entire chicken is covered. Turn the heat to medium-ish (lower is better, higher if you are not so patient) and wait until it comes to a light boil. Reduce to a simmer and cover for a loooong, long time. We’re talking around 6+ hours. The longer the tastier, but 3-4 hours will do if you must. Once your home smells unbearably delicious and you cannot wait a moment longer, remove from the heat and pour the entire contents of the pot through a metal colander into another heat proof container (I use a metal bowl, but another pot would work if you have one). Now here’s the fun/gross part. Pick all the meat you want (or can bear to before you get too grossed out) off of the bones that are sitting in your colander and toss it into your stock. Be careful of your fingers–it’s going to be suuuper super hot! I’ve burned my fingers many a time doing this. Once you’ve meat-picked to your heart’s content, transfer to your storage containers (I use mason jars) and some to your soup-sippin’ mug to try your creation. Delicious. Now you can toss all the bones and icky stuff left behind and enjoy the yumminess you made. You can use this stock as the base for tons of soups or on its own–just reheat on the stove and simmer some veggies in it or whatever you’d like! It’s a good recipe to have in your homemade arsenal. Seriously, store-bought stocks don’t even begin to compare. This should stay good in the fridge for up to about a week. If I’m not going to use it within 5 days or so, I usually freeze it. It’s always nice to have some on hand. Aaaand just like that, it’s October. My absolute favorite month. Happy October, fellow fall-lovers. 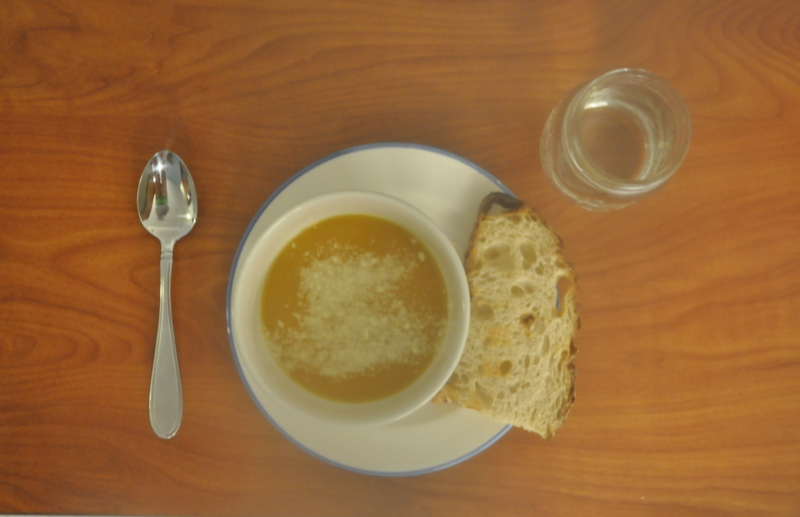 Categories: Dinner | Tags: broth, chicken, dinner, kitchen staple, soup, stock | Permalink. I joined a veggie co-op! Once a week, I get 6-8 lbs. of seasonal fruits and veggies delivered to me. It’s super fun. So far, I’ve gotten a lot of leafy greens, some radishes and turnips, bok choy (lol what), sweet potatoes, butternut squash, and some varieties of peppers and things. It’s quite interesting cooking with things I would never even think of buying (i.e. bok choy); I get to try new things, expand my cooking horizons, and eat delicious organic produce everyday. So far, I’m a big fan. 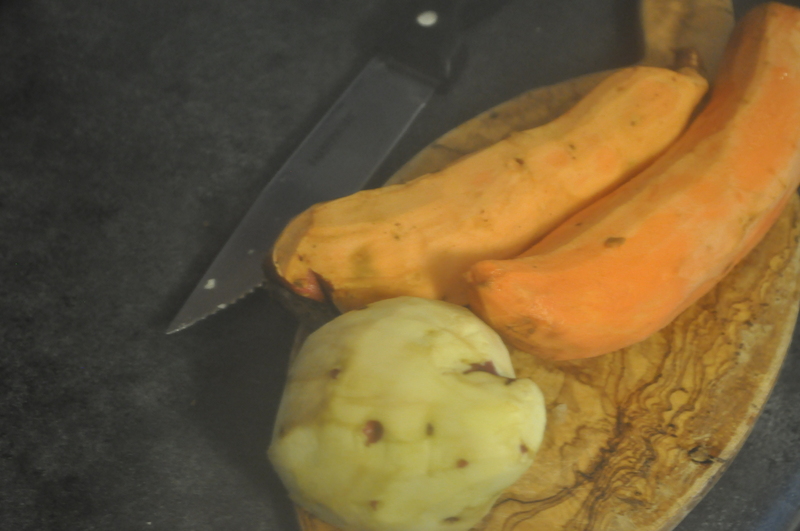 As you probably guessed, the sweet potato and butternut squash soup idea came from the fact that I had an entire butternut squash and 3 potatoes waiting to be made into something delicious. It has cooled down quite a bit and been rather drizzly over the last couple of days over here in New York, so in my mind, it is officially soup season. I will be making a lot of soup this fall, get excited. Heat the olive oil in a large soup pot over medium heat and add the garlic, cooking it about a minute until it is lightly browned. Add the water, chicken stock, and all the diced squash and potatoes and let it heat throughout. Once it starts to simmer, turn it down to low, cover, and let it sit for about 45 minutes until all the veggies are nice and tender. Take your pot off the heat and use your immersion blender (don’t have an immersion blender? Get one! This is my baby and I love it) to puree the entire mixture until fully blended and smooth. Add salt and pepper to taste and there you have it! Beautiful fall soup! I was so proud of this soup. Not that it was really that complicated of a recipe it all, but I figured it out all by myself! Also I took on quite the challenge peeling and dicing all of those things…you guys should have seen my kitchen. It looked like a disaster zone. Or like squash and potatoes spontaneously combusted in my sink and the surrounding areas. It wasn’t pretty. Thank god none of my roommates were home, otherwise I definitely would have gotten some questioning looks. It’s clean now! That’s all that counts. Heh. This soup is so comforting and delicious. And easy! I’ve seen packages at Trader Joe’s of pre-diced and peeled butternut squash–GET THAT and make this! It would be so easy and great; potatoes are nothing to peel/dice. It was the butternut squash that was the killer. I feel like that was mostly because of the fact that it was such an odd shape and our knives are not the best (in fact, they’re pretty much the worst), but it worked out. Also, if you’re a vegetarian, this soup can easily be made with vegetable stock instead of the chicken, or even just water. I added the chicken stock for some extra body and flavor, but it definitely could stand alone; the potatoes and butternut squash made it plenty creamy and thick. 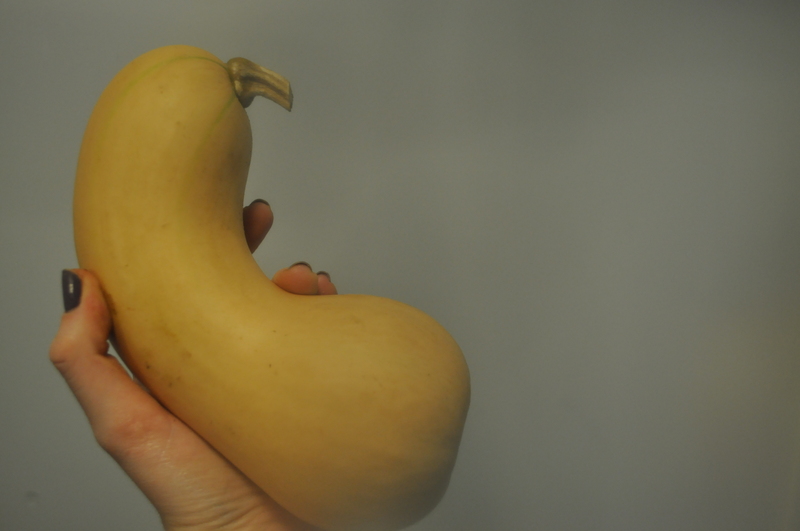 Categories: Dinner | Tags: butternut squash, dinner, potato, soup, squash, sweet potato | Permalink.